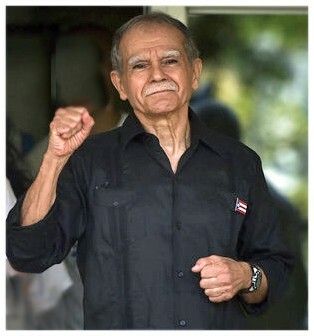 Oscar López Rivera is free! On May 17, thousands of Pu erto Ricans gave a hero’s welcome to their longest held political prisoner, Oscar López-Rivera, released after more than 35 years in U.S. prisons. Convicted of seditious conspiracy – conspiracy to overthrow the U.S. government – Oscar is widely regarded as Latin America’s Nelson Mandela, who also was imprisoned for decades for seditious conspiracy. The commutation of his 70 year sentence came as a result of a decades-long campaign that united Puerto Ricans across all sectors and garnered tremendous international support. Oscar’s release comes at a critical moment in Puerto Rico. The island is facing an intense economic crisis rooted in its colonial relationship to the U.S. The US invaded Puerto Rico in 1898 during the Spanish-American war, after which the Spanish ‘ceded’ the island to the US, and it became a US territory. More than a century after US invasion and half a century after most other colonies fought for and won their freedom, Puerto Rico is one of only a handful of colonies still fighting for self-determination. Since 2015, Puerto Rico has faced an escalating debt crisis, with the governor declaring its crushing $72 billion debt unpayable. The debt is now up to $120 billion, and the US has imposed a fiscal control board over Puerto Rico. This has resulted in extreme austerity and a total takeover of all the major institutions on the island—a move that reveals the unmistakable colonial reality of the Puerto Rican nation. Public health and infrastructure projects have been placed on hold, government workers’ pensions are being cut, university students are experiencing the highest tuition increases in US history, and people are being forced to migrate from the island. This takeover has been met with fierce resistance, from the students of the University of Puerto Rico who have been on strike since April, to the 70,000 people who took to the streets on May Day to demand an end to the chaos and suffering resulting from the fiscal takeover. Oscar will be in the San Francisco Bay Area on May 31st! We hope you can join us to celebrate him, and help us raise money for him as he begins his life back in the community that fought so long for his release.